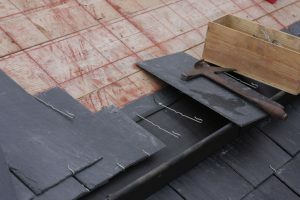 As the leading slate roofing contractor, Richard Roofing is the one roofing contractor to turn to for the finest slate roofing materials and installation. We’re specialists in replacing, installing, and maintaining slate roofs for a wide range of architectural styles and building sizes. As a slate roofing contractor and highly-experienced roofing contractor, we know that natural slate ranks among the most desirable and attractive roofing materials available. Slate is an ideal roofing material for New England’s harsh weather conditions because it repels water easily, is mildew-resistant, and withstands hot and freezing temperatures, year after year. In fact, a good slate roof installed by a reputable slate roofing contractor can last up to a century and keep its good looks without fading or degrading in the sunlight. Slate roofing’s durability means that the slightly higher cost of installation can be recouped because a slate roof will not have to be replaced within a decade or two, unlike an asphalt shingle roof. Longevity also makes slate roofing from a slate roofing contractor such as Richard Roofing more eco-friendly than asphalt shingles, which must be replaced every ten to 20 years and the toxic materials discarded. Every slate roof is unique because every piece of slate has naturally aged differently over the course of millennia, producing distinct gray hues with overtones of blue, green, or purple. Most roofing shingles try to simulate the natural variations of texture and color of slate, which is one of the original and most long-lasting roofing materials. Simply put, slate installed by an experienced slate roofing contractor such as Richard Roofing is the standard for premium roofing. To learn more about the benefits of slate roofing and get a free estimate, speak the area’s leading slater roof contractor, Richard Roofing.